If you own a t-shirt that says “Queen Bee” and people bring you gifts in hope of gaining your approval, then this is the fruit for you! People! Fruit doesn’t get much cooler than this. The bottom of the hard, leathery skin has a flower. The number of petals on the flower will match the number of bright white segments of flesh inside. Hazzah!Plus it has the cutest little stem. Smells like sweet, slightly acidic, tropical flowers. Divine. Thick exterior shell that was soft in spots and quite hard in others. I’ve read that they are pretty soft when picked from the tree and harden over the next few days. Flesh is soft and stringy, somewhat slimy with each segment having either a tough center or a seed. Very sweet, slightly bitter and medicinal. Kind of tastes like mature fruit punch. If I had to guess, I would say these are probably amazing when picked perfectly ripe, right off the tree, because there is a lot of potential here. They have an extremely interesting and exotic flavor but the texture and difficulty of cutting into them is a big drawback for me. The fact that the flower petals match the number of segments inside is just phenomenol. A vase full of these for Valentine’s Day would make my heart explode. Ba-bye red roses, there’s a new diva in town. 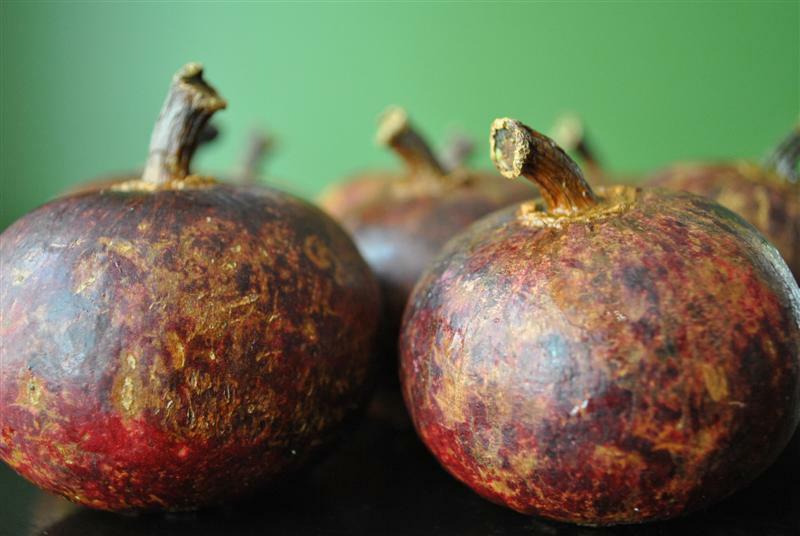 When in season, you can buy Mangosteen at some asian grocery stores and online here. If you get them online, a small amount will go to support the Fruit Maven. So thanks in advance! I can’t remember where I read something about a guy who was in Asia and who ate bagfuls of mangosteens while he was there, he was totally obsessed by them. What struck me in that article is that he said that the skin was soft! That’s when I realized that the fruit that make it here have probably little in common with what people have the chance of eating over there. Unfortunately, now, each I see those at the store, it just makes me sad and I don’t buy them anymore… I’ll have to go to Asia some day just tu have a taste of the real thing! Wierd, different and delectable…It is the M&M of the fruit world. Melts in your mouth but not your hand. You must not have had the same mangosteens I did. I am a fellow fan of fabulous fruits, and agree with you that the cherimoya gets a 5/5. 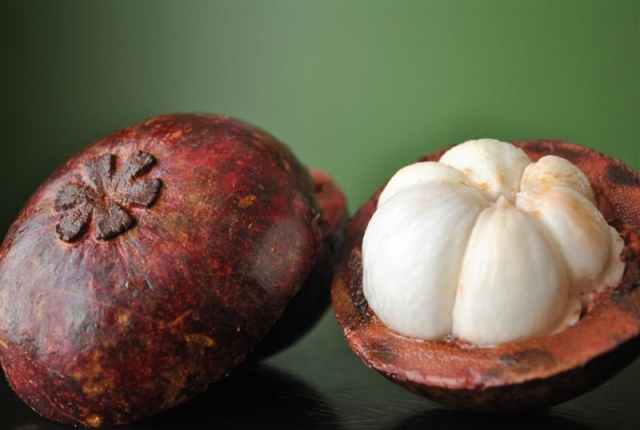 But a fresh mangosteen, like they serve in Thailand, is a 6/5! Absolutely, hands down, the most delicious fruit I’ve ever tasted in my life. No bitterness, nothing medicinal about them. I dream about those mangosteens to this day, but nothing available in the States comes close. 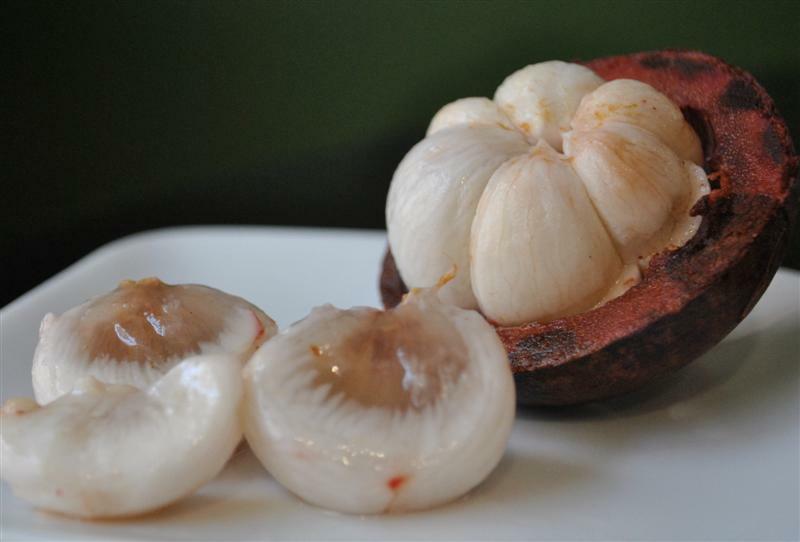 I was lucky enough to get a few really good mangosteen. The shells where hardened but the texture was consistent. The flesh was the texture of a very fine citrus. The flavor, too, was mildly citrus but with florals added. Very delicate and very delicious. rock hard exterior means the fruit was old/stored for a long time. when fresh, the stems are bright green with 4 little leaf like growths at the base of the stem… and in your photo, you can see the stem is dried and completely brown. the exterior flesh should not be HARD! It is firm yet with a subtle give (dont sqeeze too hard, they bruise easily! soft, dense, and kinda like a grapefruit skin. the outside extremely east to score and twist off the bottom half, hold the stem and peel rest off and voila ! a mangosteen popsicle! also if it is bitter or yellowed inside the bitter latex like antioxidant . substance from the peel has seeped into the flesh. The interior is sweet tart, subtly perfumed with a floral essence and dissolves almost cloud-like. As you chew, it becomes creamy somewhat like a custard or souffle held together with the delicate fibers or membranes with in each segment. Look for darkish outer color, and if there are no green stems to be had, you can take your chances with the brownish stems, but if they are rock hard, very few will be up to par.